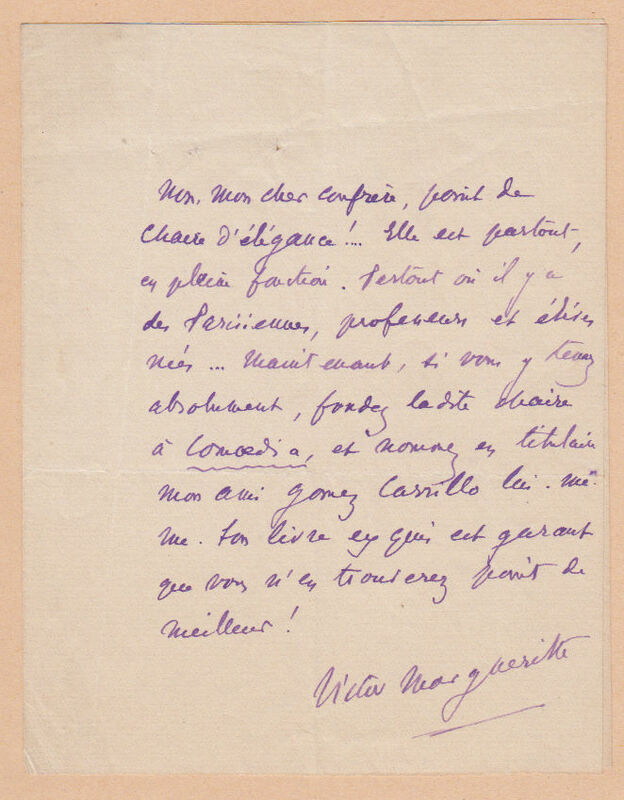 Autograph Letter Signed, about the possibility of a “chaire d’élégance”, and suggesting a “chaire à Comoedia” instead. In French, a good one page example 5 x 4 inches, integral blank leaf tipped on to part of an old album page. Undated, c. 1910. Victor Margueritte (1866-1942), French novelist. Victor Margueritte designed two pantomimes, Pierrot assassin de sa femme (Théatre Libre, 1882) and Colombine pardonnée (Cercle funambulesque, 1888), and was the author of La Garçonne. Translated into English as The Bachelor Girl, this novel deals with the life of a young woman who, upon learning that her fiancé is cheating on her, decides to live life freely and on her own terms. Amongst other things, this included having multiple sexual partners. In this letter there is a reference to his friend Enrique Gomez Carillo (1873-1927), Guatemalan literary critic and editor.